Heidi Muller and Bob Webb cross the musical boundaries between original songs and traditional tunes, blending each other’s influences from the Pacific Northwest to the Appalachian Mountains. 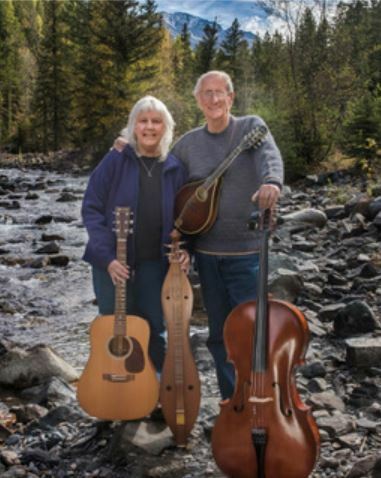 Featuring dulcimers, guitars, mandolin, electric cello, and Muller’s crystalline vocals, they have released four duo recordings: Up Hurricane Creek, Dulcimer Moon, Light the Winter’s Dark, and Seeing Things. They tour widely to concert halls, festivals and venues such as Kentucky Music Week, Ohio Valley Gathering, Tumbleweed Music Festival, the National Oregon Trails Center, Berkeley Dulcimer Gathering, the National Music Museum and the NPR live performance radio show, Mountain Stage. Described by Dulcimer Players’ News as “one of the dulcimer community’s best songwriters and performers,” Muller made her name as a Seattle recording artist in the ‘80’s and ‘90’s. Her song “Good Road” is still heard weekly on Northwest Public Radio and KPBX-Spokane after 25 years as the theme song of the Inland Folk show. Muller was a finalist in the prestigious Kerrville New Folk songwriting competition in 1989. In addition to performing as a songwriter/guitarist, she taught dulcimer workshops across the Northwest. She went on to tour nationally and record five solo CDs before she joined forces with Bob Webb. Webb settled in West Virginia as part of the 1970’s back-to-the-land movement. A talented multi-instrumentalist, he toured with the folk-rock group Stark Raven that became the house band for the Mountain Stage radio show. There he backed up many of the greats including Odetta, Arlo Guthrie, Tom Paxton and Shawn Colvin. Webb also taught music, designing a cardboard box dulcimer that he helped over 700 children and adults make and play in schools and summer camps. He became a recording engineer with his own studio, where he recorded music CDs and helped create documentaries for public radio, including “In Their Own Country” produced by Kate Long that was nominated for a Peabody Award. Muller and Webb started performing and touring together in 2003, based in Charleston, West Virginia. They were included in the West Virginia Artists Roster and worked as artists-in-residence teaching guitar, dulcimer and songwriting in schools and community settings. They also recorded oral histories for events and organizations. Muller collected the local history of Big Ugly Creek, WV and wrote songs with children and adults in a project funded by the Mid-Atlantic Arts Foundation, which later culminated in the 200-page book, Patchwork Dreams. Muller and Webb taught music for several years in the rural coalfields through Clay Community Arts. In 2005, they co-founded the Music Mentors after-school program for at-risk, inner-city children in Charleston, WV that continues today. Muller and Webb live in Joseph, OR, where they continue to make their living performing, touring, teaching, recording, and hosting the summer music camp, Dulcimer Week in the Wallowas. For more information, please visit www.heidimuller.com or email the artists at heidi.muller.music@gmail.com.